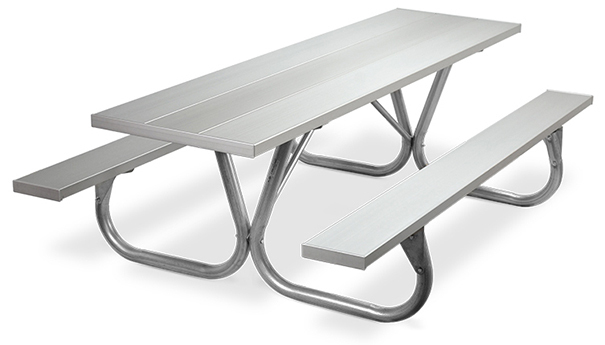 Park Chief Picnic Tables are built on an extra durable 2-3/8" O.D. galvanized steel tubing frames made from high alloy steel. The heavy-duty frames are cold rolled up to 50,000 PSI for yield strength, making these table frames 30% stronger than mill structural pipe. Bracings are also galvanized for maximum corrosion resistance. 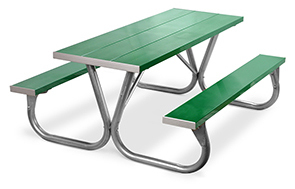 Aluminum planks can be anodized for a clear finish or powder-coated in kelly green or tan. Tables are available in 6' or 8' Lengths. 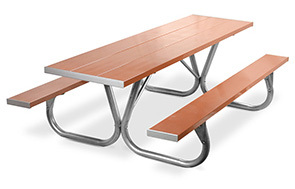 ►Need a Park Chief Picnic Table Fast? ► Items ship within 5 Days on orders up to 5 units.